It was my grandfather’s 86th birthday last Friday, so I asked him what type of cake he wanted me to bake for him. 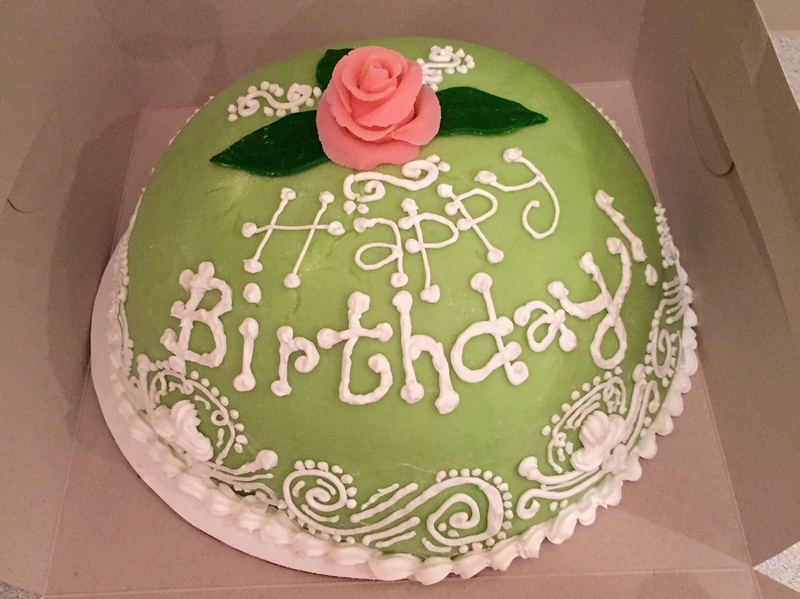 I was expecting a flavor such as chocolate or vanilla, but instead he requested Danish Princess Cake. I had no idea what this was, so I googled it, and soon realized this cake would be very challenging. 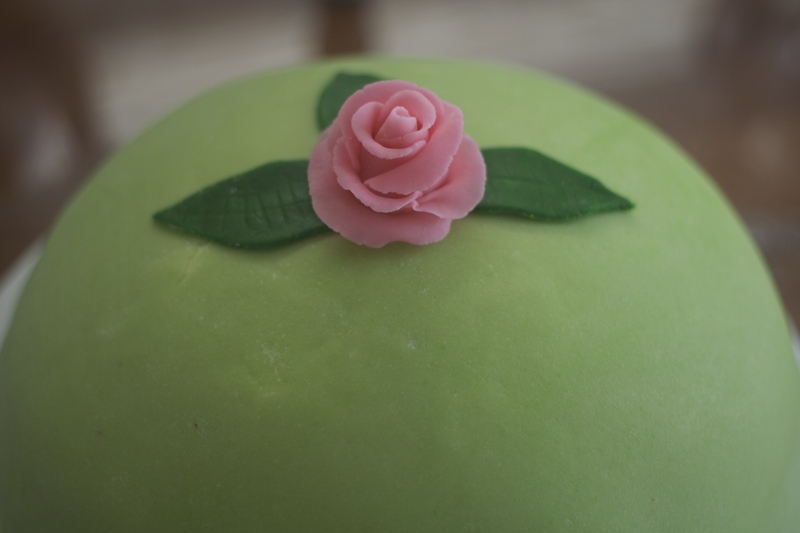 It turns out that Danish Princess Cake (also known as Swedish Princess Cake) is 3 layers of sponge cake filled with raspberry jam, custard, and whipped cream. 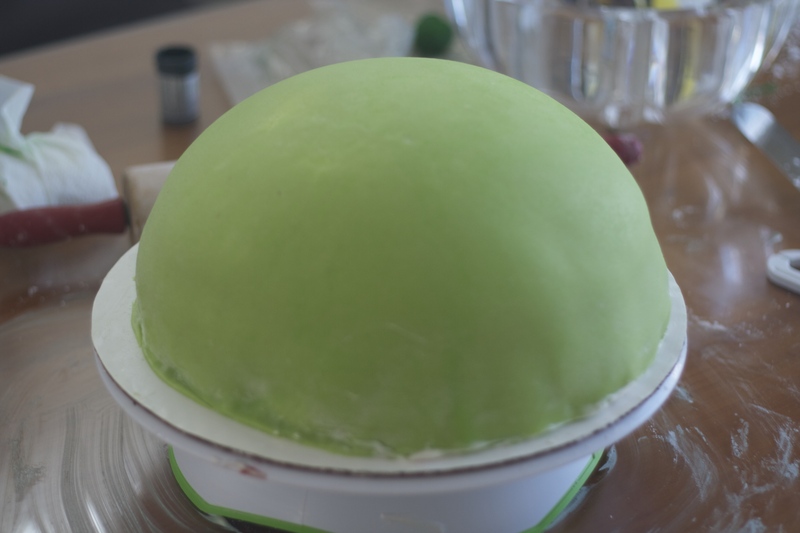 The cake is shaped like a dome and covered in a layer of green marzipan. My grandparents keep a Kosher home so I converted the recipe below to a dairy free version, and luckily I don’t think anyone tasted the difference! 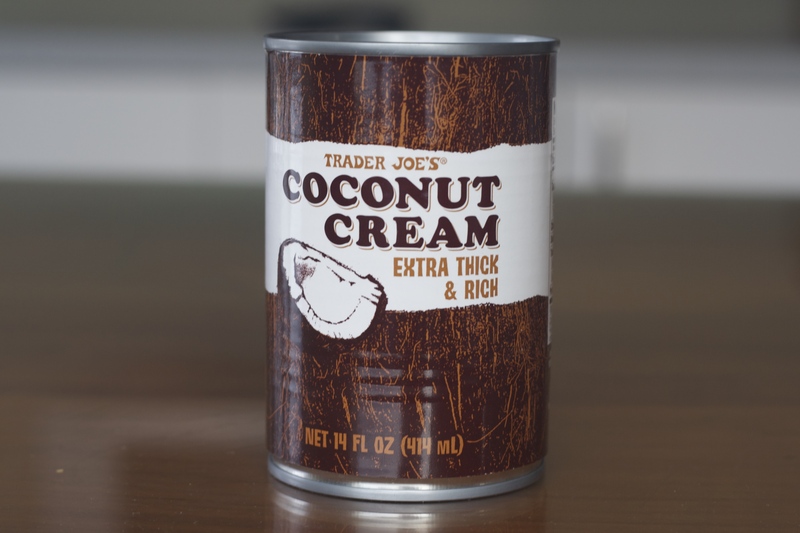 The best discovery was this Trader Joe’s Coconut Cream I used in place of whipped cream. 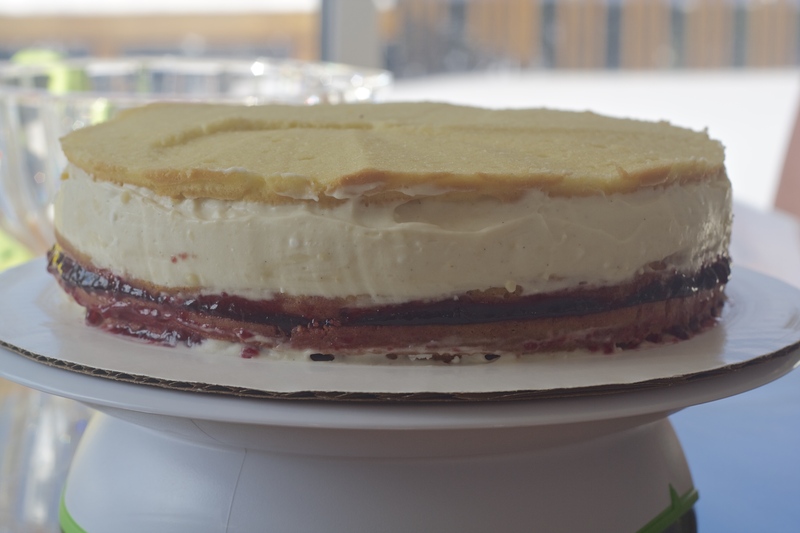 On the first day I did some prep work by baking the cake, making the simple syrup, and making the custard. The next day, I just whipped up the coconut whipped cream and started building. 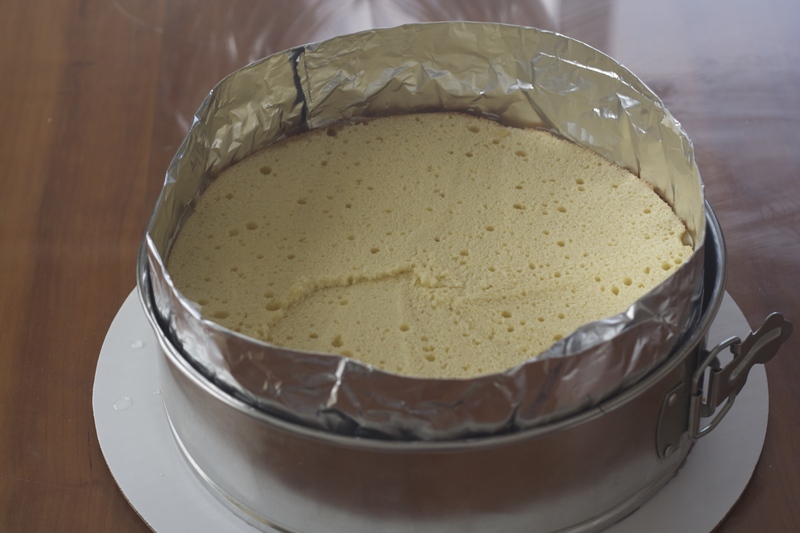 First I placed the springform pan (without the bottom) on the cake board and lined it with foil. I then put the first layer of sponge cake down. And another layer of sponge! The cake was then ready to be shaped into a dome with lots of whipped cream! My grandfather was very excited to blow out the candles and try the cake! and it tasted just about as good as it looks! Start by preparing the sponge cake. 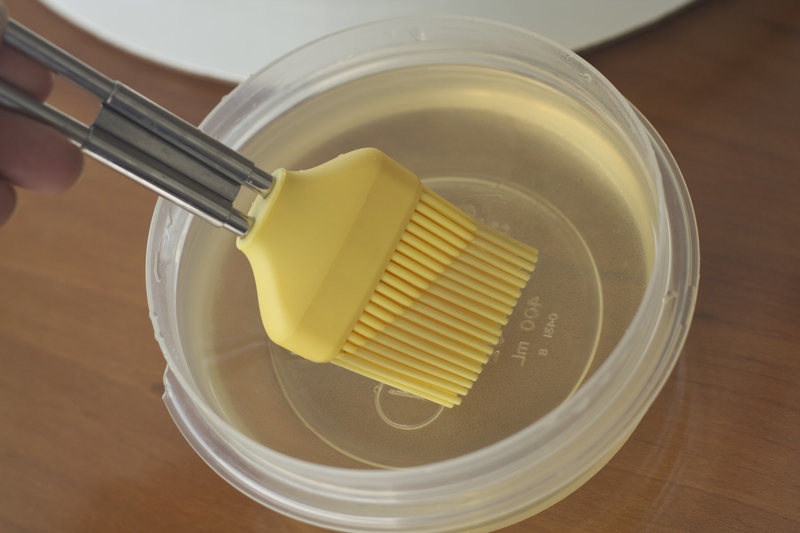 Whip the egg yolks until they are pale yellow and doubled in volume. In another bowl, whip the egg whites until frothy, gradually adding the sugar until the foam becomes stiff. Fold half of the whipped egg whites into the yolks. Fold in the remaining egg whites thoroughly, until uniform in color. In 4 batches, fold in the sifted flour and the baking powder then the butter. 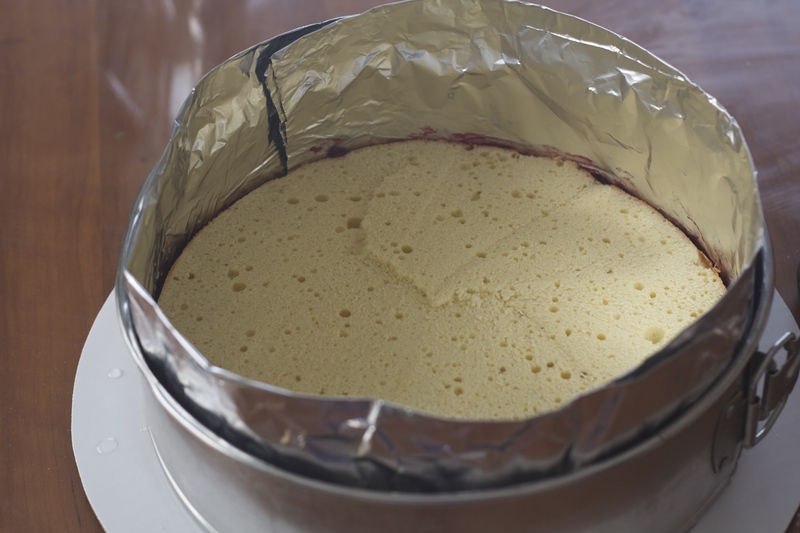 Immediately pour the batter into 2 (10-inch) greased cake pans and bake in a preheated 350 degree oven F for about 30 minutes or until a toothpick inserted in the middle comes out clean. Allow the cakes to cool on a rack. After they’ve cooled, run the tip of a knife around the edge of the cakes to loosen them from the pans and remove. Using a long serrated knife, slice both cakes into 1/2-inch thick disks. Only 3 will be needed, reserve the rest for future use. Next prepare the cream filling. Bring the milk and vanilla bean to a simmer in a medium saucepan. Remove from heat and let sit for 10 minutes to infuse. Remove vanilla bean. 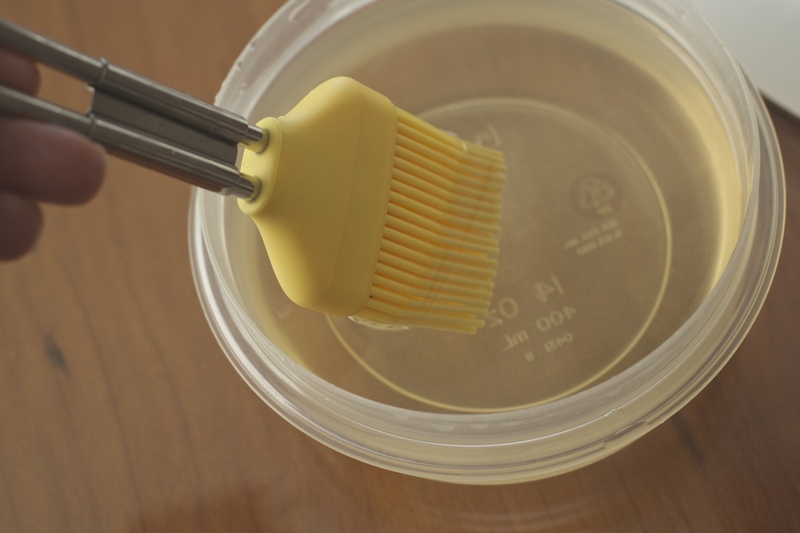 Whisk the eggs, cornstarch, sugar, and salt in a bowl until smooth. Add half of the milk into the bowl containing the eggs, whisking constantly, then return the mixture to the saucepan containing the remaining milk, whisking over moderate heat. Continue whisking until the mixture is thickened and begins to simmer. Allow cream filling to simmer, whisking for an additional 2 minutes. Transfer into another bowl, cover and allow to cool completely. Next prepare the simple syrup. Bring equal parts water and sugar to a boil in a medium saucepan, remove from heat and allow to cool. Next prepare the whipped cream.Whisk heavy cream with sugar until it is firm and holds its shape, being careful not to over whip. Add vanilla (optional if using coconut cream). Fold one-fifth of the cream into the cooled pastry cream and refrigerate, covered, until chilled (approximately 1 hour). Reserve the remaining whipped cream in the refrigerator, covered. Now it is time to assemble the cake. 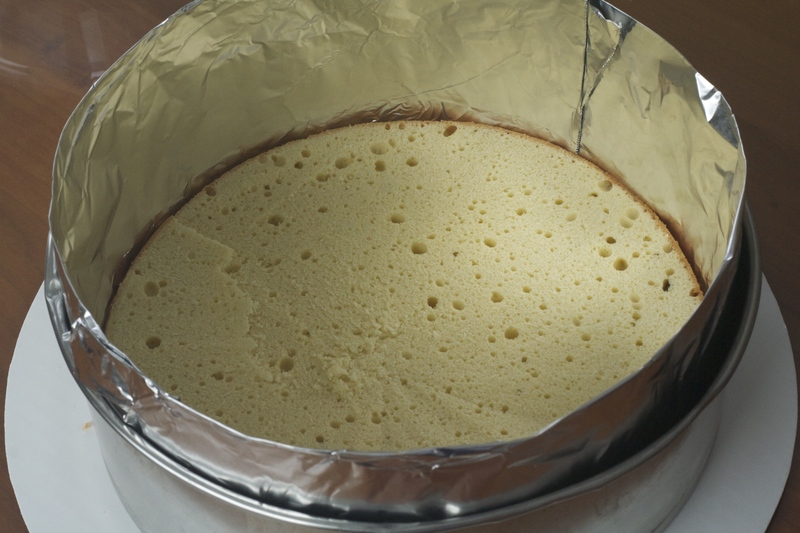 Place a 10-inch springform pan without a bottom on a 12-inch cakeboard. Place 1 layer of the sponge cake on the bottom, and generously brush with the syrup. 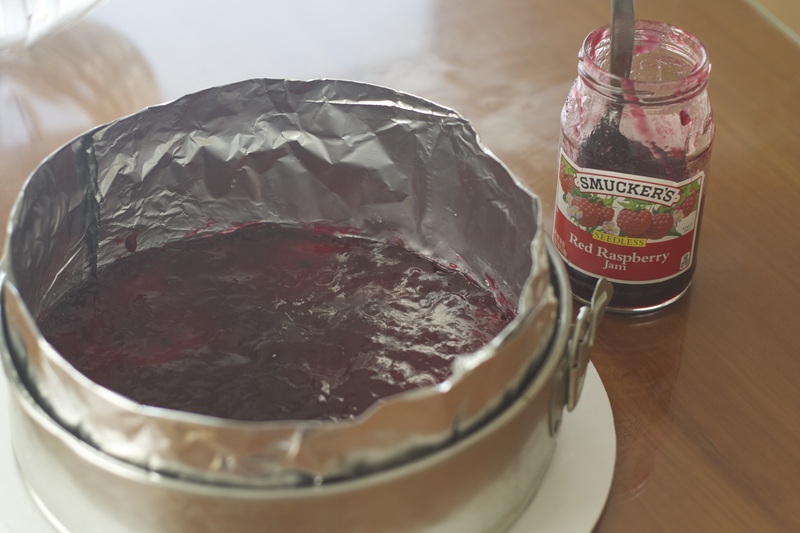 Spread the jam evenly over the syrup and place a second layer of sponge cake on top of the jam. Brush with syrup and spread the prepared cream on this layer. Top with a third layer of sponge cake and again, brush with the syrup. Using your hands, press lightly on the cake to ensure cake is level. Place in freezer for 1 hour. 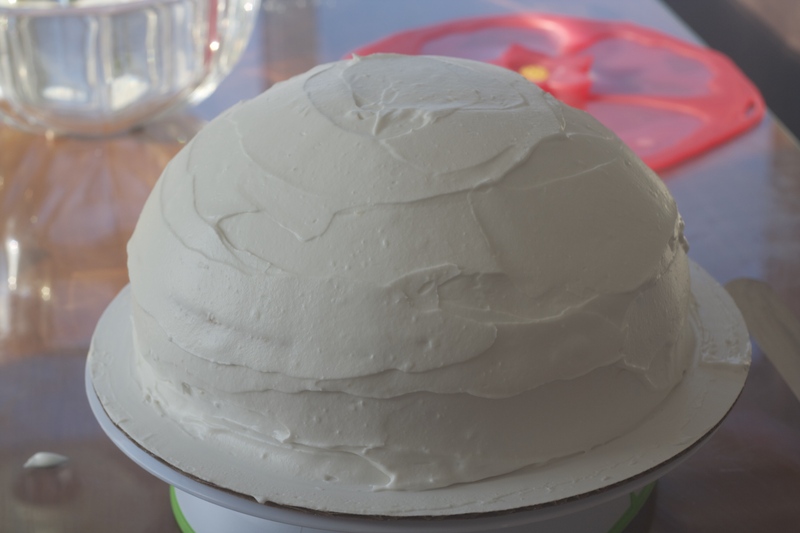 Remove the springform mold from the cake and generously frost the sides with the reserved whipped cream. 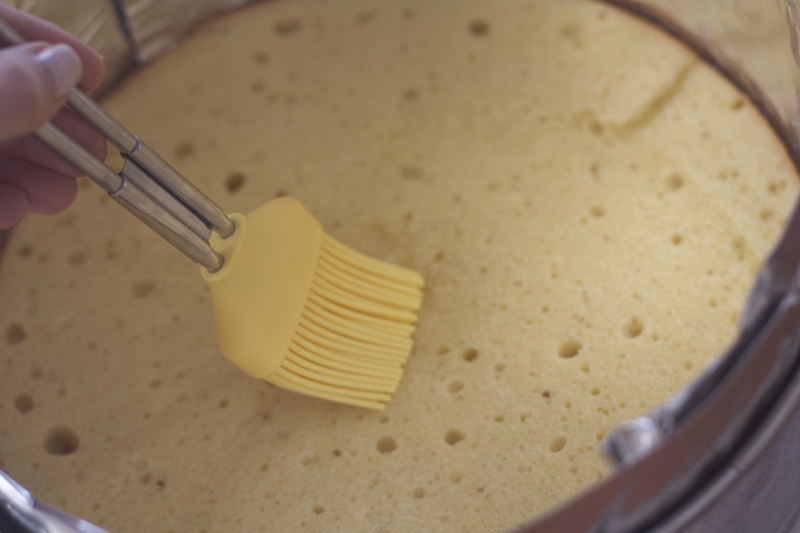 Pour the remaining whipped cream directly on the center of the top of the cake and using a spatula, make a mound, working from the center out. The height of the whipped cream should be approximately 1 1/2-inches in the center and about 1/2-inch on the edges. Color a walnut size piece of marzipan with the green food coloring until the marzipan is deep green. Reserve. Using a sifter or a fine mesh strainer, dust a scrupulously clean work surface with confectioners’ sugar. 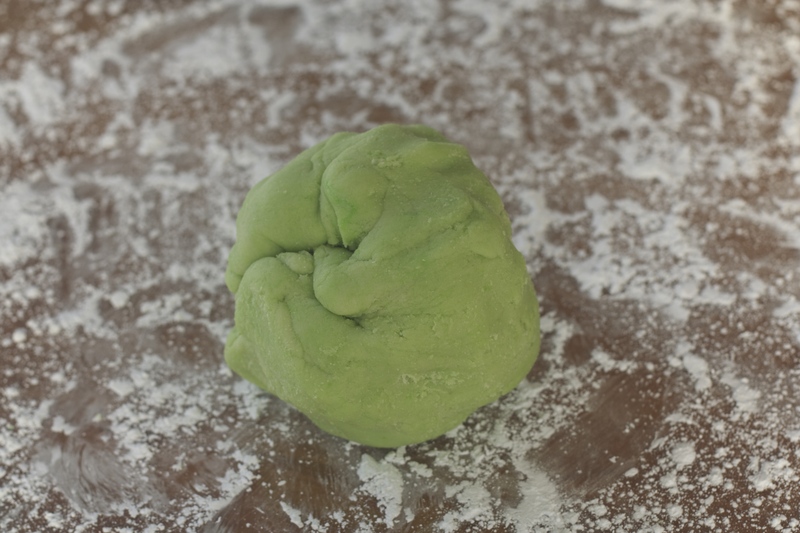 Tear off a pea-sized piece of green marzipan and knead it with the remaining marzipan until it is uniform in color. 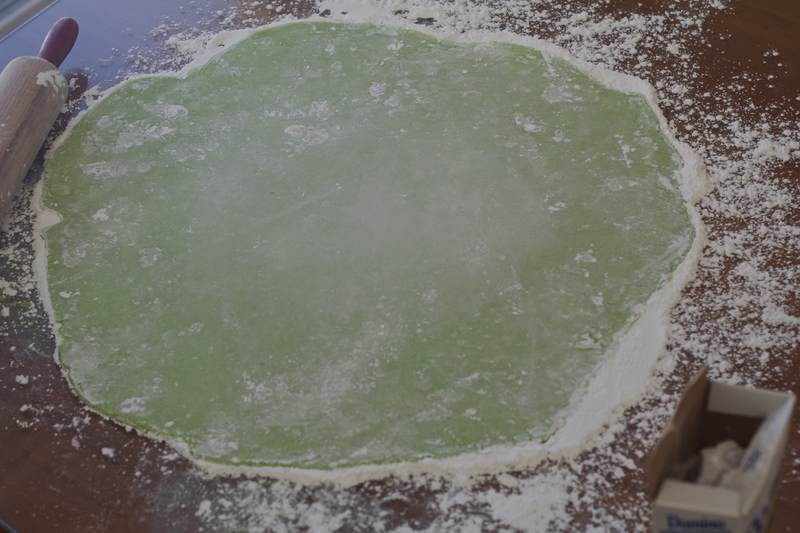 Add additional pieces from the green marzipan until it achieves a light green color (it should be the color of a Granny Smith apple). Reserve the leftover deep green marzipan for leaves. 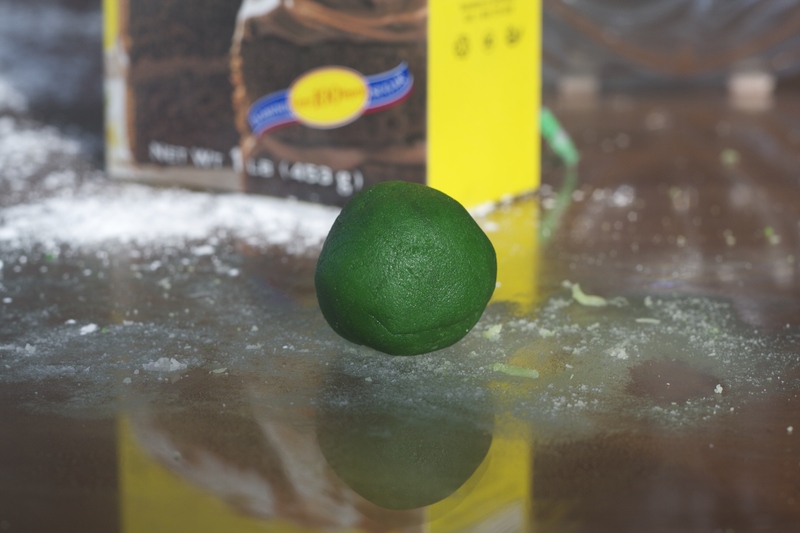 Dust a work surface again with confectioners’ sugar and roll the light green marzipan to a 1/10-inch thick circle, using as much confectioners’ sugar as necessary during rolling to prevent the marzipan from sticking to the work surface. When you’re finished rolling, marzipan should be stretched enough to cover the entire cake and sides. 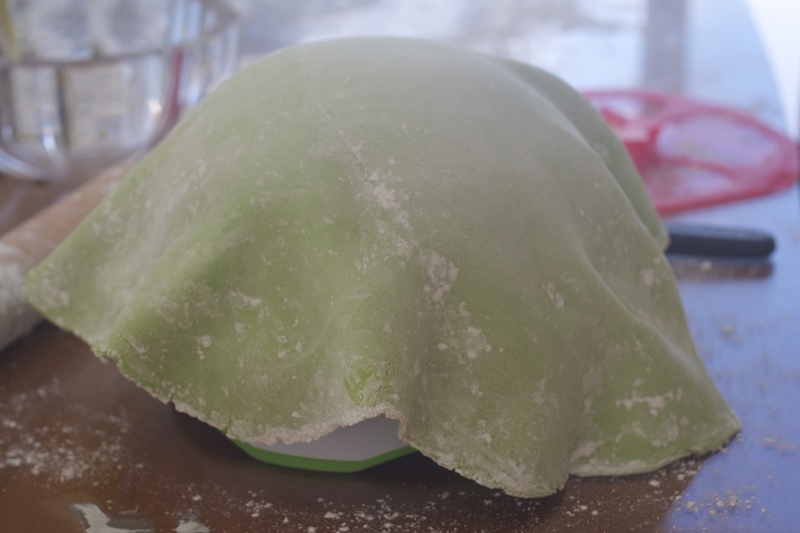 Roll marzipan on rolling pin and gently lay it down on top of the cake, smoothing out the dome and lightly pressing on the bottom edges of the cake to form a perfect dome. 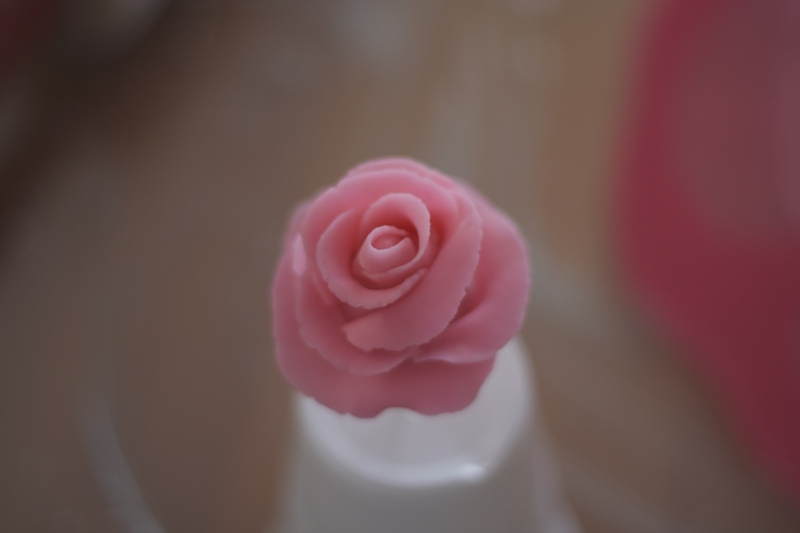 Decorate with leftover marzipan, making a braided border on the edge of the cake or simply dust the entire cake with confectioners’ sugar (or make a rose and decorate with icing like I did). O.O WOW! I am in a desperate need for that cake. The cake is picture-perfect and I really admire your piping work, but really the whole story is immensely touching. I wonder what inspired your grandfather to ask for it?